Read more about Passover dining in "Reimagining the Seder Menu"
Preheat oven to 350°F. Line a jelly roll pan or cookie sheet with parchment paper. Melt the chocolate using one of the methods described in the accompanying box. Remove the chocolate from the heat source, add the sugar and oil, and whisk well. Add the eggs and mix. Add the vanilla sugar, cocoa, potato starch, ground almonds, and salt and mix well. Add the chocolate chips and mix and distribute them. Divide the dough in half and shape into two loaves, each about 9 x 3 inches (23 x 7.5 cm). Place both loaves on the lined jelly roll pan and bake for 30 minutes. Let the loaves cool for 10 minutes (do not turn off the oven). Cut each loaf crosswise into ¾-to 1-inch-thick (2-to 2.5-cm) slices. Place the cookies, cut side up, on a parchment-lined jelly roll pan. Bake for another 14 minutes, or until the cookies are firm to the touch on the outside but still feel soft on the inside. Check them after 10-12 minutes so that you don’t over bake the cookies. To melt chocolate, you can use the top part of a double boiler or a microwave oven. A double boiler is a specially designed saucepan that has a top bowl that fits snugly over a saucepan. For either method, first break or chop the chocolate into 1-inch (2.5-cm) pieces. Using a double boiler: Place water in the bottom of the saucepan and place the chopped chocolate in the insert. When you bring the water to a simmer, it gently melts the chocolate in the insert. You can create your own double boiler by placing 2 to 3 inches (5 to 8 cm) of water in a medium saucepan and resting a medium-size metal bowl containing the chopped chocolate on top. Stir the chocolate occasionally, until all of it has melted. Using a microwave oven: Place the chocolate pieces in a microwave-safe bowl, such as a large glass bowl. Heat the chocolate for 1 minute at high power. Remove the bowl from the microwave oven and give the chocolate a good stir, mixing the melted pieces into the unmelted ones, for 30 seconds. Heat for another 45 seconds and stir well again. If the chocolate is not completely melted, heat it for another 30 seconds and stir. Repeat this process for another 15 seconds if necessary. Do not heat the chocolate in the microwave oven for several minutes straight or it will burn. 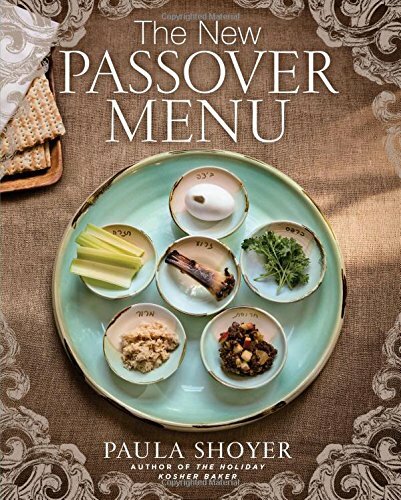 Excerpted from The New Passover Menu by Paula Shoyer. Copyright ©2015 by Paula Shoyer. Photos by Michael Bennett Kress. Excerpted by permission of Sterling Publishing. All rights reserved. No part of this excerpt may be reproduced or reprinted without permission in writing from the publisher.